WASHINGTON - The extreme partisanship gripping American politics could be reduced by two landmark cases coming to the Supreme Court on Tuesday, and Chief Justice John Roberts looms as the deciding vote. More broadly, what's at stake is the way state and congressional election districts are redrawn once every decade in most states - a system dominated by political self-interest that grows more intense every time the Supreme Court declines to tame it. If the justices fail to act, election districts drawn after the 2020 census could be even more extreme, leading to more lopsided elections and more ideological gridlock in Congress. 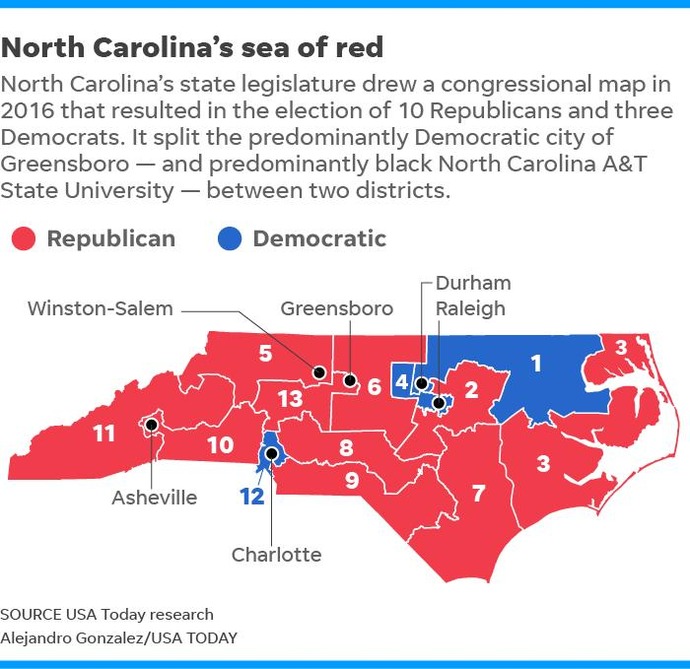 "Our hope is that there is a concern about basic fairness," says Dan Vicuña, national redistricting manager at Common Cause, which is challenging the North Carolina map. "Either side of the political aisle can be the victim of this." That's not always the case. When state legislative power is shared - or in eight states, including California, where the process is governed by a commission - the maps often are drawn fairly. "We want to make clear that to the extent we are going to use political data in drawing this map, it is to gain partisan advantage," state Republican Rep. David Lewis said. He proposed a 10-3 edge for Republicans "because I do not believe it's possible to draw a map with 11 Republicans and two Democrats." "The North Carolina case is about as extreme as you're ever going to get," says Paul Smith, one of the lawyers representing the League of Women Voters in the case. "I think the chief justice is keenly aware of these political overtones and will want to say ... this is an equal opportunity offense," says Michael Kimberly, who represents the Maryland challengers. "This is not about picking one party over the other." Roberts may be inclined to render a minimalist decision that leaves most of the heavy lifting to Congress and the states. The U.S. House of Representatives passed legislation this month that would give the power to draw congressional maps to independent commissions - something Colorado, Michigan and Missouri voters approved in November. "The democratic process is actively engaged in this," says Misha Tseytlin, a former Wisconsin solicitor general who filed a friend-of-the-court brief on behalf of members of Congress from North Carolina. "The value of democracy is allowing the people to solve their own problems." "I believe Roberts is looking for a way to get the court out of these questions," he says.